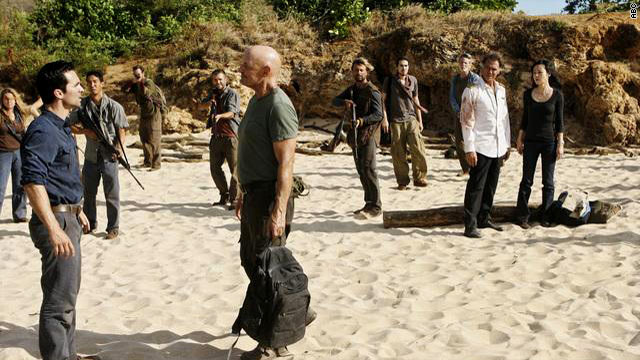 The end awaits for "Lost," with Sunday's finale appropriately titled "The End." (CNN) -- After Sunday's "Lost" finale, we'll all find ourselves in a new world. It's a world that's changed plenty since 2004, when the show premiered. At the time, serialized dramas were believed to be on the way out; police procedurals and reality shows were riding high. "Lost" helped change that trend. Serialized dramas are once again considered viable (NBC is giving a couple a shot at 10 p.m., an about-face from its attempt to run a chattering Jay Leno five days a week), and -- especially in a socially wired world -- there's more of an attempt for shows to connect with fans, which "Lost" did with aplomb. MARQUEE: Keeping up with "Lost"
Technology was key to "Lost's" success, says media marketing expert Adam Hanft, co-author of "Dictionary of the Future" and the CEO of the marketing firm Hanft Projects. The show shrewdly made use of trends -- social media, TV-on-DVD immersion, DVR -- and took its audience seriously, blazing a trail others could follow. "There's a lot of respect the show has for its viewers ... and it flies in the face of the so-called dumbing down of America. And I think that level of respect that the programmers extended is reciprocated by the love of the viewers," he says. "That level of intimacy and familiarity has been helped along by their very canny use of social media." He believes that the broadcast networks can have success by using the same strategies. Still, in some ways "Lost" was one of a kind. Television has had obsession-inviting shows before -- the fanaticism of "Star Trek" fans eventually led to several more TV shows and a dozen movies -- but history is littered with the debris of shows that tried something as intricate as "Lost." The 1990s had several, including "Twin Peaks," the miniseries "Wild Palms" and "Profit," with only "The X-Files" succeeding long-term, notes Robert Thompson, founding director of the Bleier Center for Television and Popular Culture at Syracuse University. "Right when we were starting to lose faith, and right when 'Lost' was losing audience and people became suspicious of the narrative ... the producers said, 'You're right and we need to end the show. ... Otherwise it will die, and it will die an embarrassing death,' " he recalls. Moreover, ABC agreed -- unusual for a broadcast network, which often hopes to spin series out indefinitely. "They were able to initiate one of the greatest moments ever in 'Lost,' which was the season finale of Season 3, the flash forward twist," Jensen says. "And from Season 4 on, 'Lost' was able to chart a big-picture story ... [and] bring an end to the story of these castaways." As the finale approaches, the wisdom of the decision is obvious. The show is earning the kind of attention most shows never get: a huge cover story in EW, a New York Times-hosted chat with producers Carlton Cuse and Damon Lindelof, expansion of the finale -- which will air in theaters in some locales -- to 2½ hours, with 30-second ads selling for $900,000, which approaches Oscar territory. Even the show's soundtrack composer, Michael Giacchino, was the subject of a major story in The New Yorker's "Innovators" issue. ABC isn't skimping on "Lost" programming in general: the pilot will re-air Saturday and a two-hour retrospective will precede the finale, which will be followed by a special "Jimmy Kimmel Live." Moreover, the network is auctioning the props this summer, an event that should gather a pretty penny. But though "Lost" has had an impact on broadcast TV, it hasn't remade it. Science fiction, which has done best on cable or in syndication, still struggles on the major networks. The kind of thought-provoking literary detail found on "Lost" -- referencing Flann O'Brien's "The Third Policeman" or 17th-century British philosophers -- remains a rarity on television, period. Indeed, some observers -- including producer Cuse -- believe the "Lost" finale is another nail in the coffin of broadcast television, a medium trying to hold down expenses and losing audience. iReport: Share your views on the final "Lost"
"The media landscape has changed dramatically even in the six years of this show," he said in an interview with The New York Times. "The scale and the scope and the size of this, this is the most expensive television series made anywhere in the world. And in this media landscape, it's incredibly hard to capitalize something the way 'Lost' has been capitalized. We have a fractured media environment, and there are many more choices, but as a result there are smaller resources for every show that gets made, and so we feel a little bit like we're blacksmiths in the internet era." Jensen is inclined to agree, noting the fadeouts of similar shows such as "Heroes" and "FlashForward." " 'Lost' was created as a unique property, and it was a phenomenon ... but what [networks] found out is that the culture can't support so many serialized stories at the same time," he says. "And what happens to these shows when they hit that inevitable speed bump ... [is] people start to jump off the bandwagon." Add in other issues -- media fragmentation, time shifting, creative spark -- and it's no wonder broadcast TV stays with tried-and-true formats such as cop and hospital shows, he says. "That's why what television wants isn't the next 'Lost,' they want the next 'Bones,' they want the next 'Mentalist' -- which are very clever and innovative shows in their right, but they're single-serving entertainment experiences," he says. Geek Out! : Can anything replace "Lost?" But Thompson and Hanft believe a show in "Lost's" spirit can still be pulled off by broadcast television, despite -- or perhaps because of -- its reliance on bulk audiences. Thompson notes that TV goes in cycles; sitcoms were once thought dead, too. And Hanft says that, given broadcast TV's challenges, it has little to lose. "One could argue that the keening over the loss of 'Lost' and the gap it leaves in the schedule suggests that there's a huge audience and an opportunity to come up with -- not a clone, which is unfortunately the way TV operates normally -- but some other inspired, innovative idea that connects emotionally with the audience, that presents a cast that people care about, that leaves them hanging in a good way, that uses social media platforms to engage and keep the audience going between shows," he says. Still, "Lost" was something special, he says. He gets a little philosophical himself when talking about why the show worked. "I often wonder if the appeal of 'Lost' [is due to] some giant metaphorical structure -- people feeling marooned in their own lives, cut off," he says. "I think there's something about that show people can identify with and emotionally bond with over their own situation as well." Jensen is getting ready to cut the cord. Once Sunday night is a memory and he's posted his last "Lost" blog, he's going to join a Time Inc. Habitat for Humanity house-building project in the Los Angeles, California, area. "After being so in my head for so long about 'Lost,' this is a way to almost ritualistically honor the end of 'Lost,' " he says. "I can get out of my head and do something good." He confesses he'll miss it, though. He can't help it. He's saying goodbye to friends, and he's hoping for a worthy send-off. "As much as sometimes the mysteries have frustrated us, what has remained true through it all is these core characters -- we love them, and we're really invested in them, and we want to see how they end up," he says. "They're just really compelling people in a really exotic world."